Anyone who knows films will be able to tell how they felt when they first came across the iconic opening scene from Trainspotting. Choose life. That thumping, churning manifesto that pulls out all the knives in your heart. This opening sequence, branded firmly on those of us who went on to develop even the smallest chunk of teen nihilism, is stitched as firmly into our hearts. The run. That shy smile over the bonnet of the car. Iggy Pop’s ‘Lust for life’. It’s a perfect prayer too ‘what-if?’. The same could be said, indeed, for the close. Our anti-hero has given them the slip - and as the culmination of the who-needs-enemies-when-you-got-friends builds to it’s epic denouement; we find our comfort in ‘Born Slippy’ as Renton disappears off into golden horizons. It makes sense then, that the sequel to this epic masterpiece of cinema, Trainspotting 2 – was heralded with great anticipation. This is the anticipation then, with which we logically approach a collaboration between these two musical book-ends of the original Trainspotting film, Underworld and Iggy Pop. It’s a concept that on first glance might make Teatime Dub Encounters paradoxical. How can the king of punk and the electro-dance princes battle a middle ground? Can these two mega-giants collaborate, and create something that’s audible? I’m a fan of eccentricity, in all forms – but even without my world-view of ‘the weirder the better” I am glad to report that yes, it works. 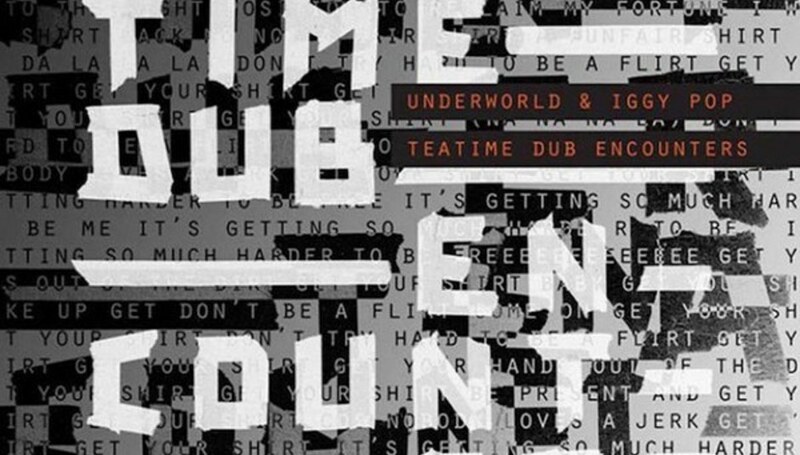 Teatime Dub Encounters is a beast of three perspectives, over four EP tracks. It’s an example of a glorious spoken-word-music jive that’s becoming increasingly popular. It’s an electronic update on whatever happened to the eponymous Jonny from ‘Lust for Life’s lyrics. It’s a piece of nostalgia, wrapped up for me and irrevocably linked with the reaction on the surface of my skin to popping another sneaky ecstasy pill in younger years in the dark corner of a stairwell. Take it from an ex-pro; don’t touch the ones with the Illuminati symbol on – unless you want to puke your guts up 7 hours later as a girl half your size with blonde hair spun from heaven holds your necklace back. ‘Bells & Circles’ begins with Iggy’s rich-with-age voice, that declares rashly “If I had wings, I wouldn’t do anything beautiful or transcendent – NO! I’d get my finger into everything I wanted! I’d do all the beautiful things…” and the electronic dub behind provides a surreal, Terry Gillingham style open to this EP. We drive forward then, into ‘Trapped’, which has a more cyber-goth feel, and wouldn’t be out of place if it blared out of Cyberdog’s speakers on a Saturday afternoon. Its repetition is almost meditative, yet – broken up with Iggy’s chorus of “I’m trapped I’m trapped and I’ll never get out no more” it serves more as a parable to your mate Brian who still sneaks out to raves in woods all these years later. Wanna end up like those guys in Trainspotting 2? Nah. ‘I’ll See Big’ strokes us back into comfort, a slow spoken-word return for Iggy - where the back-track sounds like the victory lap on an 80s video-game. ‘Get Your Shirt’ closes the party, throws us back to those ‘are you coming up yet?’ Underworld tracks of 1996 – and could easily take pride of place in any contemporary dance club. All in all, if Trainspotting itself deserved a sequel – so did the music in it….and I, for one, welcome this new brand of electro-spoken-word – even if it’s only for four songs.